How do both elite athletes and business leaders climb to the top? Contrary to what you might think, it’s effective habits rather than innate talent that are their keys to success. Dr. Jason Selk—director of mental training for the 2011 World Series Champions, the St. Louis Cardinals—and star business coach Tom Bartow combine the most effective elements of both their disciplines to offer an organizational improvement plan that anyone can learn and apply immediately. They outline eight fundamental ways to get organized, including the “time paradox,” which allows precision to set your schedule free, and a two-minute mental training that will start your day with focus, confidence, and energy. 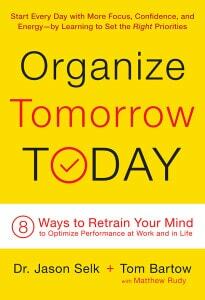 Organize Tomorrow Today helps readers to move past their performance roadblocks and achieve more productive lives.